Did your tech really lower the lift onto the locks? How much does that vehicle really weigh? 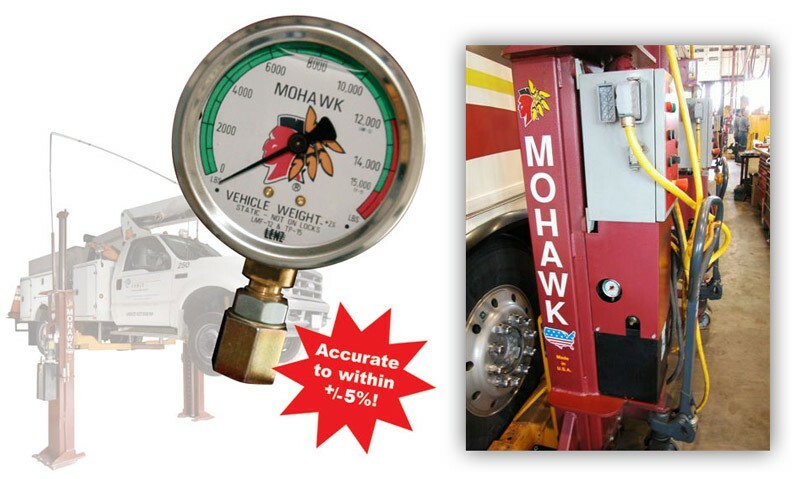 With Mohawk’s Lift Weight Gauge You’ll Know! Protects Your Workers, Makes You Money. Keep your technicians and your equipment safe by not overloading your lift. Mohawk’s weight gauge will measure vehicle weight to within 5% accuracy. The weight gauge is a great customer service and sales tool. Do you have a customer complaining of poor gas mileage or short brake life? The gauge will help you show them their vehicle is overloaded. The weight gauge can also help your service techs justify selling heavier shocks and heavy duty brakes to generate additional revenue. The weight gauge insures the lift has been lowered onto the mechanical. When the gauge reads “0”, you then know the lift has been lowered on the mechanical lock and is being properly used. The weight gauge is quick and easy to use. Installs in just minutes, directly into the hydraulic system. Once installed, raise the lift and release the “up” button. Then simply read the gauge. It’s that easy. Large and easy-to-read scale is mounted on the motor side, for quick and easy readings. CAUTION: If needle is in red zone for your lift, lower vehicle immediately. Overloading a lift can damage the lift and cause personal injury.